You are here: Home / Fillet Knife / What’s the Best Pocket Knife for Fishing? What’s the Best Pocket Knife for Fishing? We all love a day spent with a rod and reel. However, when your flies are taking up occupancy in every tree branch within a quarter mile, your lures are hooking your earlobes (or worse, your cheek), or your line is tangled in one of the guides on your surfcasting pole, that relaxation you so covet just ain’t happening. In those situations, or when you need to dress and fillet your catch, you need a good fishing knife to help address the worst of problems on the water (and the best of situations as well, as you need a good fishing knife for filleting). In this article, I’m going to break down what qualities are essential in a strong fishing knife. 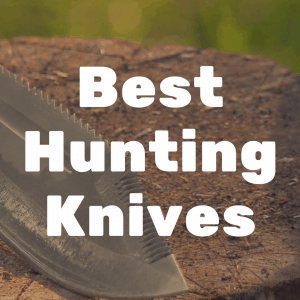 Later, I’ll go into depth in recommending five top fishing knives that will help you have the best day possible on the water. Below, please feel free to use the interactive table to compare and contrast the best fishing knives currently available on the market. 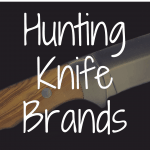 What Makes a Good Fishing Knife? First, the materials used in making the knife blade are critical. If the knife blade is not worth using, then the knife, overall, is not worth using. Second, the materials used in making the handle (often referred to as the scales) are important. If the handle is slippery when gripped in the rain or a sweaty hand, then the knife becomes dangerous to use. A fishing knife blade should ride the line between being sharp enough to fillet a fish yet also resistant to corrosion. Many knife manufacturers sacrifice edge quality for corrosion resistance. As the top five list below shows, manufacturers do not need to sacrifice a quality blade to ensure that the blade is resistant to rust. When fishing, it goes without saying that your hands will get wet, either due to the weather, sweat, or fish guts. A good fishing knife needs to be slip-proof under such conditions, so you do not accidentally cut yourself trying to get a fish off the line. For the most part, a good fishing blade is long and thin. The stocky blades that work well in the forest or in a tactical environment are not well suited to filleting a fish. In fact, many who fish will have a special fillet knife and then a general utility knife. Choosing to go with one all purpose knife may not be possible given the types of fishing one does. For fillet knives, the blade should be flexible, long, and, generally, possess either a straight back or trailing point design.. These design features allow for the knife to get as close as possible to the rib cage and spine during the carving process. Getting as close to the bone as possible means that you harvest as much meat as possible. For fishing utility knives, such as ones used to cut away tangles or remove hooks, the blade need not be flexible, but still must be corrosion resistant. It also should be safe to use in rough waters, if you plan on ever fishing from a boat. 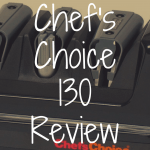 What are the best fishing knives? While no one knife can be considered “perfect” for all of your fishing needs, the following five knives are outstanding examples that should be in your tackle box. About this knife: One of two folding fillet knives on this list, the CRKT Clark Fork fillet knife is made of 5Cr13MoV steel alloy and has a glass-filled nylon and plastic handle. To save space in a tackle box, the knife folds, with one part of the handle swinging around once the blade is opened to rest behind it and lock the blade in place. Pros: CRKT has used a high-quality steel alloy to make this lightweight and flexible fishing knife, and the knife is durable enough even to be used for dressing game. 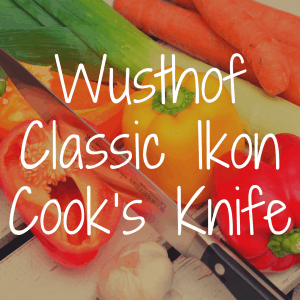 Additionally, as seen in this video, one can access – and clean – every part of the knife; there are no hidden nooks and crannies for bacteria to hide. Cons: This knife, as seen in the linked video, has two hinges, one where the blade attaches to the handle, and a second hinge where part of the handle folds inside of itself and locks the blade in place (the linked video includes a depiction of the two hinges). Multiple hinges mean multiple possible points of failure, as wear and tear can break down either hinge. About this knife: I imagine that this is the knife carried in the pocket of Norman Maclean or Ernest Hemingway while they went fishing. The Case Fishing Knife has two principal components, a long clip point knife, which could be a suitable substitute for a fish fillet knife, and a descaler/hook remover. It is a good all-in-one option for when you do not want to carry multiple knives out to the lake. It would not work well as a fillet knife for grouper or salmon, but it would suffice for smaller lake fish. Pros: The Case Fishing Knife addresses multiple needs, something few fishing knives do. It is also arguably the most aesthetically pleasing knife on this list. Cons: The danger of trying to be decent at doing everything is that one ends up doing nothing exceptionally well. Beyond casual lake or river fishing, this is not the sort of knife that stands up to rigorous use on the water. Additionally, the blade is made of a proprietary Tru-Sharp Stainless Steel, which knife aficionados believe to be comparable to low quality 420 alloy steel. About this knife: There are two versions of this knife worth considering: a folding version, to compete with the CRKT Clark Fork (above), and a fixed-blade version that comes with a sturdy plastic sheath (there is also a Silver Creek Bait Knife that would serve one well as a utility blade). Pros: This is an incredibly sharp, flexible knife blade, and fits the traditional bill of what a fillet knife should be. Cons: Those who are used to paying less than $20.00 for a fillet knife will find the price of the Silver Creek (MSRP of $48.00) to be high. The blade is made of somewhat low-quality 420J steel but is reported to hold its edge very well. 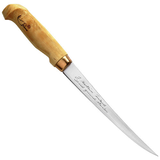 About this knife: Like the Case Fishing Knife, the Opinel No. 12 has a classic design. While this knife is definitely experiencing a “hipster” resurgence, it is undeniable that it is an excellent knife for the cost. The Slimline No. 12 has a 4.7-inch stainless steel blade and a beechwood handle. While the carbon steel blades are more durable than the stainless steel blades used by Opinel, the stainless steel blades are more corrosion resistant, making them a better fit for fishing. Pros: The thin blade of the Slimline No. 12 is a good general purpose blade, able to work as both a fillet knife and as a utility knife. Additionally, the low cost of Opinel knives means that it is perfectly reasonable to have a few blades stashed away. 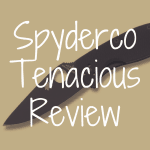 About this knife: While many of the knives discussed here have strong connections to the past, the Spyderco Atlantic Salt is definitely a knife that was designed to be forward-looking. Designed with a sheep’s foot blade for safety (when using a knife onboard a ship that is pitching around in rough seas, a sheep’s foot blade is not likely to stab a foot if dropped). 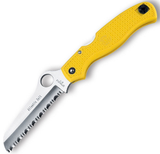 Additionally, its maritime yellow fiberglass-reinforced nylon handle is specially designed to be slip proof (and has a lanyard point to ensure that a knife will not go into the drink if dropped). Spyderco makes the Atlantic Salt from a non-carbon steel alloy, which makes it exceptionally corrosion resistant. 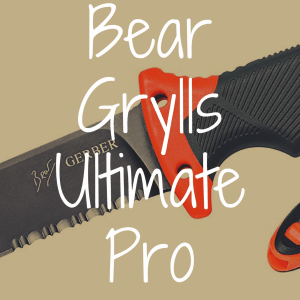 Pros: The serrated blade is perfect for handling fishing line and rope, and this also doubles as one of the best rescue knives on the market. The high visibility handle makes it possible to retrieve the Atlantic Salt if dropped. Cons: This is definitely a utility knife, and would be horrible for filleting or cleaning a fish, even if it is one of the best folding knives for sale. Some may find the price of this knife to be much higher than what they are used to for fishing knives.